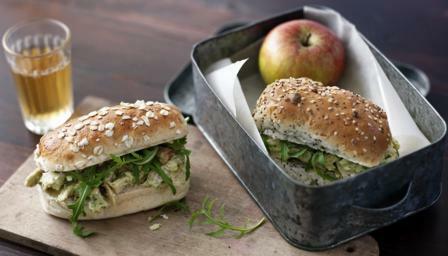 These sandwiches take no time to make and are great for a school packed lunch. Each sandwich provides 347 kcal, 30g protein, 29g carbohydrate (of which 2.2g sugars), 12.5g fat (of which 2.5g saturates), 3g fibre and 1g salt per portion. Mix the mayonnaise and pesto together in a bowl. Gently stir in the shredded chicken. Fill the rolls with the chicken mixture and top with some rocket. 6 granary or seeded bread rolls, sliced horizontally, lightly buttered.